The Children’s Hope Foundation was founded in 1997 in England with the aim to provide medical, learning and leisure equipment for children and young persons suffering from severe illnesses or disabilities; or who were enduring extreme circumstances and for the relief of poverty and the advancement of education. Keeping this philosophy in mind, a branch was opened in Dubai in 2000 under the patronage of His Highness Sheikh Ahmed bin Saeed Al Maktoum. Mrs. Zenny Hirji, the CHF Chairperson, played a key role in forming the Dubai branch of CHF. She moved to Dubai from London and brought with her years of charity experience with various groups in the UK, including Children’s Hope Foundation. Zenny quickly assembled a group of like-minded volunteers to continue CHF’s work in Dubai and, most importantly, she secured a large number of sponsors who generously support CHF’s work. Currently, there are 10 volunteers on the CHF organizing committee including Mrs. Deena Motiwalla, CHF’s Co-Chairperson. We appeal to the philanthropists, donor agencies, communities and individuals to come forward and take part in our noble cause by helping us in taking care of the Poor, Needy and Deprived people of our society. Your help can be in the form of money, commodities or voluntary work. Wish you all a Very Happy and prosperous New Year. May Dadar Ahura Mazda bestow on you and your family all the Happiness of this World. But Are You Aware that there are many fellow Brethren in our community, who do not have a square meal to eat?? Many of them, old and infirm, neglected by society, some of them, by their own children, are fighting for survival in this cruel world. Our fund established in 1969 has made steady progress. For financial year ended 31/3/2005 educational aid disbursed was Rs.6,71,451 to 749 students (Last year Rs.5,96,760 to 822 students) who are poor and deserving boys and girls of the Parsi community from Mumbai, Surat, Navsari, Pune and other parts of India. Our establishment expenses are kept to the bare minimum of Rs.8128 (Last year Rs.8233) for inevitable expenses which work out to 1.05% (Last year 1.2 %)of our total income of Rs.7,74,663 (Last year Rs.6,84,842) . There is a downward trend in the interest rates which has resulted in our income from investments declining sharply. Our fund was able to dsburse higher quantum of educational aid solely due to receipt of generous donations of Rs.4,00, 892 as compared to last year Rs.3,23,639. Our fund has received corpus donation of Rs.15 lakhs compared to last year Rs.2.3 lakhs. This corpus donation is invested in approved securities and only the income derived from such investments are utilised for giving educational aid. We firmly believe that educating our young people is the most essential factor in the progress of our community. We, therefore, count upon our generous donors to give us substantial donations that will enable us to grant maximum amount of educational aid to the poor and deserving students to meet the ever increasing cost of education. 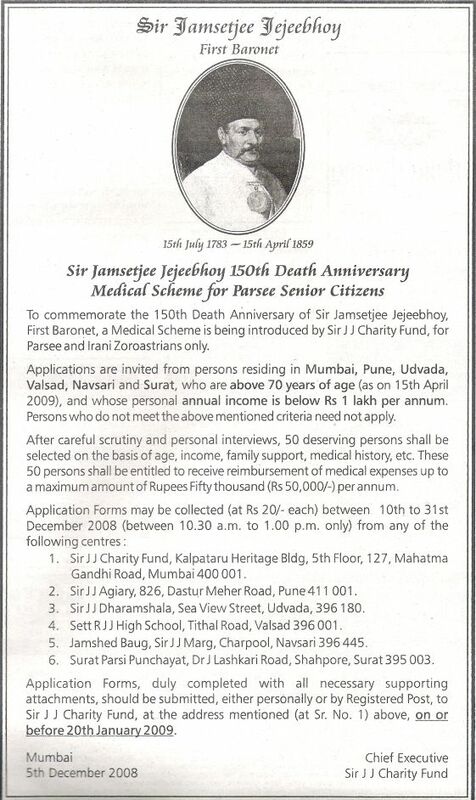 Kindly draw your cheques in favour of Mancherji Joshi Memorial Education Fund and forward them to the above address. GREETINGS IN THE NAME OF AHURA MAZDA. ONCE AGAIN I COME TO YOU TO ASK YOU TO THINK ABOUT OUR ATASH PADSHAH SAHIBS. MOST OF THE PADSHAH SAHIBS IN THE RURAL AREAS ARE STARVING FOR KATHIS. SEVERAL PADSHAHS IN BOMBAY ARE ALSO ON THE VERGE OF CLOSING DOWN. INCOME FROM THE FOUNDERS CORPUS HAS HALVED AND COST OF BAVAL KATHIS HAVE DOUBLED IN THE LAST COUPLE OF YEARS. HENCE THE NEED FOR US FROM ALL OVER THE WORLD TO CHIP IN AND HELP KEEP THE HOLY FIRES BURNING TILL INFINITY. Please mention in your covering letter that the amount sent is “Donation for Fire Temple only”. Receipt will be issued for every donation. Wishing you the blessings of the Padshah Sahibs for the amount well spent. USHTA AHMAI YAHMAI USHTA KAHMAICHIT. 16-D, Ismail Bldg., 3rd Floor, 381 Dr.D.N.Road, Fort, Mumbai 400-001. Attached is the Baimai Surti Foundation report for 2008. Due to the very low donation this year we could buy only one new Auto rickshaw, and convert 8 previously donated ones from petrol to gas as required by the government. There are many more in desperate need of help. Please note our new address and tel/fax no. are still a priority in their parents' lives. holiday dreams of the children. bring the toys with you to the gift-wrapping party. and supplies. $2,000 are needed to cover the out-of-pocket expenses.